A hedge is a great option to provide a line of separation in the garden or provide a privacy screen. Some fabulous options for a hedge are flowering plants that provide colorful blooms in the summer or provide fruit that can be plucked for food. The length and breadth of the hedge needs to be planned as well as support and training for the plants to assume the desired shape. Here are some great choices to try. Rose of Sharon: This is a bush that can be trained to form a hedge of any height. Prune to shape each year for a mass of blooms that will draw attention. Wild Rose: A favorite plant used for hedges in the by-gone eras, Wild Rose requires minimal care except pruning to maintain shape. The abundant showers of blooms are sure to delight all. The thorns in the stems will help keeps animals and intruders at bay. Once the blooms are done, rose hips will form in the fall that will provide its own beauty! Rose Rugosa: This is another excellent option that requires pruning to maintain shape and flowers vigorously. Once blooms are spent, the rose hips will form. Blackberry: Blackberry is excellent for a hedge and yields flowers as well as blackberries that will be loved by all including the birds! Plucking the berries will be a fun activity. 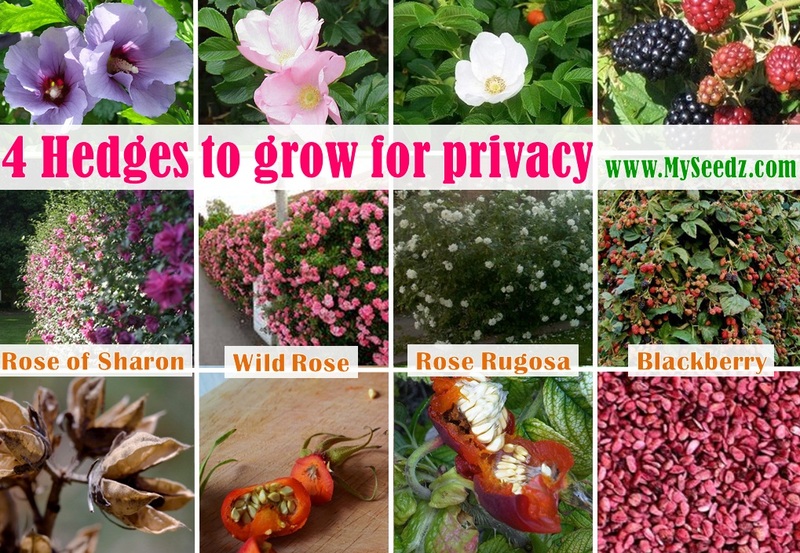 All the above options grow from seed and can be transplanted in their position. Seeds are available from http://www.MySeedz.com.